If you are interested in booking a charter, or want more information, you can call Capt. Hap Farrell at (508) 255-6211 (home), or at (508) 240-8267 (boat). You can also drop him a line via email at stunmai@copper.net. 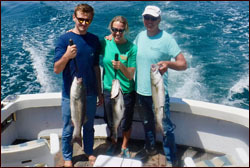 If you are looking to go fishing, but aren't interested in booking the boat for yourself, please call and see if a split charter can be arranged. If you are in the area of Rock Harbor, please feel free to stop by the boat, especially in the morning, and see what's happening in the Bay. Please remember, the Stunmai II fishes out of Rock Harbor, in Orleans. Rock Harbor is a tidal harbor, so sailing times are dictated by the tides. Click here for the scheduled sailing times of the days you are interested in.